Download a PDF of this Legislative Memo with citations here. Sound Transit board members want $15 billion more in new taxes from people living in King, Snohomish and Pierce counties to expand light rail; much larger than the $12 billion statewide transportation package lawmakers have debated over the past few years. Sound Transit officials are just now delivering the first phase of light rail, 10 years late and billions of dollars over budget. Sound Transit board members want to impose new tax increases for rail before meeting their past promise of 105,000 trips per day by 2010. Additionally, Sound Transit failed to meet projected ridership targets used to justify hundreds of millions of dollars in federal grants. The Puget Sound Regional Council estimates rail ridership will account for about one percent of all daily trips in the region by 2040. In 2013, the average King County household residing in Sound Transit’s district paid over $1,100 in local taxes for transit, with the burden falling hardest on low-income and working families. By the time the first phase of light rail is completed, the average household in Sound Transit’s district will have paid over $7,300 in special taxes for light rail and buses. Board members of the Regional Transit Authority, known as Sound Transit, run a public transit agency, created in 1996, that operates commuter rail, light rail and express bus systems in King, Snohomish, and Pierce Counties. The Board is comprised of local elected leaders and the Secretary of the Washington State Department of Transportation. Approximately 1,130,000 households are located in Sound Transit’s special taxing district. Sound Transit board members currently impose a 0.9 percent sales tax, a 0.3 percent Motor Vehicle Excise Tax (MVET) and a 0.8 percent rental car fee on people living in the taxing district and who rent cars. In 2013, they collected $903 million in revenue comprised primarily of $662 million in local taxes, $57 million in fare-box receipts and $153 million in federal grants. Still, Sound Transit board members want to add to their past tax increases so they can build more light rail, but they have already imposed the maximum tax burden they can under current law. In 1996, voters approved Sound Move, a 0.4 percent sales tax increase and a 0.3 percent MVET to build 21 miles of light rail by 2006. Voters defeated Sound Transit’s request for tax increases in 2007. Sound Transit board members altered their proposal and the following year voters approved Sound Transit 2, a 0.5 percent sales tax increase to expand light rail to 51 miles. Sound Transit board members have yet to complete the system they promised in 1996, which is over budget and 10 years behind schedule, and the $17.9 billion plan they promised voters in 2008 is not yet fully under construction. Even so, Sound Transit board members are lobbying state lawmakers to change state law so they can spend another $15 billion to build light rail to Tacoma and Everett. Under Senate Bill 5128, announced two days into the 2015 Legislative Session, Sound Transit would seek to increase the regional sales tax rate on residents by 0.5 percent, raising the sales tax rate to 10 percent in many communities, raise the unpopular Motor Vehicle Excise Tax rate they currently impose on residents by 0.8 percent to 1.1 percent, and increase property taxes by $25 per $100,000 of assessed value. The tax increases would be subject to a public vote. In light of Governor Inslee’s proposal to impose a new cap-and-trade tax and a new capital gains tax, it is important for state and local lawmakers, and the public, to thoroughly review Sound Transit’s current tax burden and its failures in past performance. Sound Transit board members say they are now planning to complete most of their original 1996 Sound Move 10-year light rail plan by 2016, and continue to Northgate by 2021. Originally, they promised they would complete the first phase by 2006 and that light rail would carry 105,000 riders per day in 2010. Today the system carries only 33,445 riders per weekday, less than a third of what was originally promised. Taxpayers are also paying much more than what they originally agreed to. In 1996, Sound Transit promised to build 21 miles of light rail (from South 200th Street to N.E. 45th Street) and spend $2.3 billion in year of expenditure dollars. Even after canceling some planned light rail stations in Seattle and delaying other promises to future ballot measures, the Sound Transit board is spending $5.3 billion for the original line, more than double the original price they had presented to taxpayers. Sound Transit’s planning and budgeting failures raise a question: Why are board members eager to raise taxes for Phase Three before they find out whether Phase One (Sound Move), still incomplete and untested, will deliver the 105,000 trips per day that justified the cost to voters in 1996? This question is underlined now that the Phase One project is 10 years late and its cost has doubled. Currently, officials at five public transit agencies impose taxes on people living in King, Snohomish, and Pierce Counties: Sound Transit, King County Metro Transit, Community Transit, Pierce Transit and Everett Transit. Each has its own tax authority and special taxing district. Some of these boundaries overlap. For example, people in Seattle pay a 1.0 percent sales tax and property taxes for King County Metro Transit and 0.9 percent sales tax to Sound Transit, totaling a 1.9 percent transit sales tax, even if they don’t use public transit. In addition to paying different agencies at once, many families pay transit taxes several times over. For example, a three-car family in Seattle would pay three $60 car tab fees ($180) to Metro and pay three MVETs, at 0.3 percent of each vehicle’s estimated value, to Sound Transit. The MVET is seen by many as unfair, because the government’s estimated value is often more than a car’s true market value. Sound Transit officials also receive grant money from the federal government, funded by taxpayers throughout the Puget Sound region, Washington state and the country. Over the past two decades, transit agency officials have sharply increased the tax burden they impose on families living in the Puget Sound region. 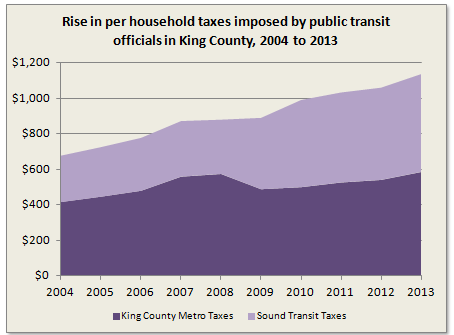 Today, the average King County household in Sound Transit’s special taxing district (about 80 percent of King County residents) pays over $1,100 every year in local taxes just for mass transit, not including the state or federal taxes they pay. For Sound Transit alone, this amounts to about $550 in local taxes per household in 2013. Under current tax rates, this financial burden will increase to $643 in yearly taxes for Sound Transit rail and buses in 2018. 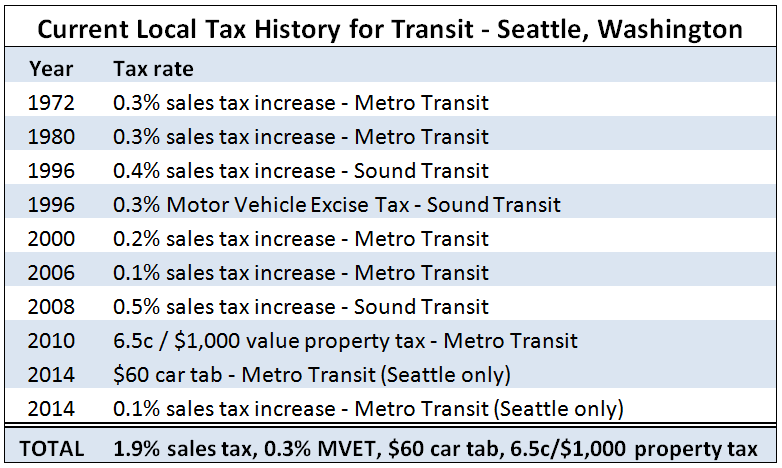 However, if Sound Transit board members impose the full increases in regressive sales and MVET taxes they are seeking, the average household’s tax burden would balloon to $1,185 in 2018, a $542 increase just for Sound Transit rail and buses. In addition, Sound Transit board members could increase the property tax burden on residents and add another $100 to a typical household’s tax bill, based on a $400,000 property valuation. Starting in the 1990s, the average household in Sound Transit’s tax district has paid over $6,100 in local taxes to Sound Transit alone, spent predominantly on rail. By the time Sound Transit’s first phase of rail is complete in 2016, the average household will have paid about $7,300 in taxes to Sound Transit. When people travel, they choose light rail less than one percent of the time. Federal estimates show people in the average household make 9.5 trips per day. Within Sound Transit’s district, that equals 3.9 billion total trips every year. Sound Transit’s total light rail ridership in 2013 was just 9.7 million, or only 0.24 percent of all trips people made in the taxing district. The Puget Sound Regional Council, the four-county planning organization, estimates that public transit’s overall mode share, rail and buses, may increase to as much as five percent of daily trips by 2040, after billions in additional spending. Light rail would account for about one percent of all daily trips in the region 25 years from now. The low ridership share is remarkable, considering public transit officials will collect and spend nearly 60 percent of all transportation-related tax and fee revenue in the region over the next 15 years. Public transit service is a small yet important part of the region’s transportation network. Given past failures, however, state and local leaders should make sure they enact the most effective, efficient and equitable program of transit taxation and spending, one that recognizes public transit’s shortfalls and seeks to rebuild trust with the public. A 50 percent increase in regressive sales taxes, nearly a four-fold increase in car tab fees and new property taxes for transit will increase income inequality in the region, and is likely to result in a transit system that underperforms in gaining the number of riders forecast. Even without another tax increase for light rail, current tax revenues relative to mode share is concerning. Further disproportionate spending would expand the gap between costs to taxpayers and benefits to the public. The $15 billion Sound Transit officials are seeking is much larger than the $12 billion statewide transportation package lawmakers have considered passing over the past few years. In addition, the final cost of fixing the stuck Bertha tunneling machine and completing the massive Alaskan Way Tunnel project are unknown. Taxes for rail already consume scarce public resources that could be used to accomplish other important legislative priorities, like funding the McCleary education decision or paying billions of dollars toward funding Initiative 1351, the class size initiative that narrowly passed in 2014. The supreme court held lawmakers in contempt for failures in public education, not for a supposed lack of light rail. State lawmakers should call a timeout on Sound Transit board members’ request to impose new taxes. In 1996 Sound Transit leaders said their Phase One Sound Move program was an “opportunity for the region to test drive a regional transit system before deciding how much more of the vision to commit to.” Yet, once their tax revenue flow has been secured, Sound Transit board members never fulfilled all of their promises, instead they pushed forward with more spending and more tax increases despite their failures. Rail ridership continues to fall short of the official promises that were used to justify hundreds of millions of dollars in federal construction grants awarded to Sound Transit. Only when the promised 1996 Sound Move system is complete will ridership data allow lawmakers to “test drive” whether or not increasing the tax burden on families is justified and in the financial and transportation interests of Washington residents. Guess what? Government officials say you'll be stuck in traffic for years to come.